Since joining the Reardon Law Firm Joseph has devoted himself to his clients. He focuses on civil litigation in the areas of personal injury, wrongful death, product liability, medical malpractice, and worker's compensation. Joseph has been selected as a Rising Star in the legal profession by Connecticut Magazine every year since 2012 and as a Top 100 Trial Lawyer by the National Trial Lawyers since 2014. He has also been recognized as a "New Leader in the Law" by the Connecticut Law Tribune. 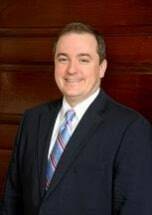 He currently serves on the Board of Governors for the Connecticut Trial Lawyers Association and is a member of the Connecticut Bar Association, the New York Bar Association, New London County Bar Association, and the American Association for Justice. Attorney Barnes is admitted to practice before the state and federal courts in Connecticut and New York. He is also admitted to practice before the United States Court of Appeals for the Second Circuit, the Mohegan Tribal Gaming Disputes Court, and the Mashantucket Pequot Tribal Court. Attorney Barnes is a graduate of Colgate University and Quinnipiac University School of Law.